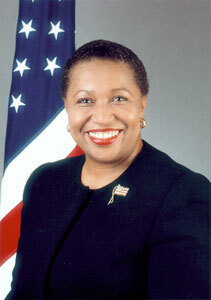 Carol Moseley Braun came to Haverford on Sunday, February 29, 2004, to speak about a new vision for our government, one which would address the issues of all people, rather than select groups. Carol Moseley Braun came to Haverford on Sunday, February 29, 2004, to speak about a new vision for our government, one which would address the issues of all people, rather than select groups. A democrat from Illinois, Moseley Braun served as the first African American female and the first African American democrat in the U.S. Senate from 1993-1999. She also held the position of Special Consultant to the U.S. Department of Education in 1999 and was appointed as the U.S. Ambassador to New Zealand by President Clinton that same year. Making it onto the primary ballot in 20 states, Moseley Braun put forth her bid for the presidency under the slogan“Take the Men Only sign off the White House door,” but she told the Arizona Republic“really it's about giving America the chance to take advantage of the contributions that women and non-traditional candidates can give.” Due to lack of funds, she withdrew her candidacy on January 14, 2004, but the support she received throughout America during her campaign gives her hope that a female African American could become president in the near future. First and foremost, Carol Moseley Braun encouraged Haverford students to learn about government in order to engage themselves politically. She described government as“the reason for the political season” and“the expression of power that affects us from the cradle to the grave.” She stressed the importance of individual action to the bettering of society as a whole, saying“history turns on slender hinges.” She told several stories, all of which proved that momentous change begins with individual action. During her time spent as Ambassador to New Zealand, Moseley Braun learned a new way of looking at the past and the future. While Americans often consider the past to be that which is behind us and the future to be that which awaits ahead, the native peoples of New Zealand consider the past to be what is in front of you as that which you know, and the future to be behind you as that which you do not know. From this perspective, keeping an eye on the past will bring us to a brighter future. There have been“chapters of pain and chapters of triumph in American history,” she said, but Moseley Braun believes that we continue to move in the direction of living up to our original ideals in the founding of this country. During discussion, students asked about the future of the Democratic Party and the 2004 election. In response, Moseley Braun stressed the importance of getting voters to the polls, but she also talked about the need for Democrats to create a“big tent” which will encompass the ideas of more of its members. She encouraged liberals to redefine liberalism and make it something to be proud of, rather than an ugly branding, and pointed out that the kind of conservatism that Bush is putting forth is not typical conservatism. In addition to labeling herself a member of the ABB (Anybody but Bush) Party, Moseley Braun said that both Kerry and Edwards are“great Americans” and that she will fully support whomever the Democratic Party chooses as its representative. While many Americans vote based on personality over a real impetus to change, the real“gospel of government,” according to Moseley Braun, is to talk to the people about issues and to make sure that everyone is heard. The tension between individual and public interest is real, but the sad fact is that the majority of the American people are not fully represented in our government. If we do not address the people's needs, then the result will be alienation and an apathetic view toward government. However, Moseley Braun encouraged Haverford students not to become disillusioned and reminded everyone that politics is, after all, a process. Nothing happens overnight.